this week in the Herald, I talk about the quiet end to Maersk lines short lived MMX Service, Congestion problems in the uk caused in part by software, the shelved merger of Horizon Maritime and their new ship, plus some other updates. 4000TEU Boats are getting scrapped at a fast rate – with 52 heading for the heap in the last 30 days. 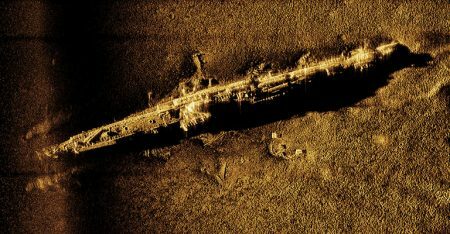 Kracken Robotics, produced imagery of 2 sunken submarines and a ship off Rhode Island to bolster work for their protection. from the Wall Street Journal – how North Korea uses a fleet of ships to fund the regime. CBC Reporter goes through sea survival training. 1.cats getting in the way. Nov 27, 1770 – Horatio Nelson entered the Royal Navy as a midshipman in HMS Raisonnable. Nov 22, 1718 – Captain Edward Teach, AKA ‘Blackbeard’ is killed by Lt. Maynard, R.N. off the coast of Virginia. This entry was posted in Weekly News on November 28, 2018 by Peter.